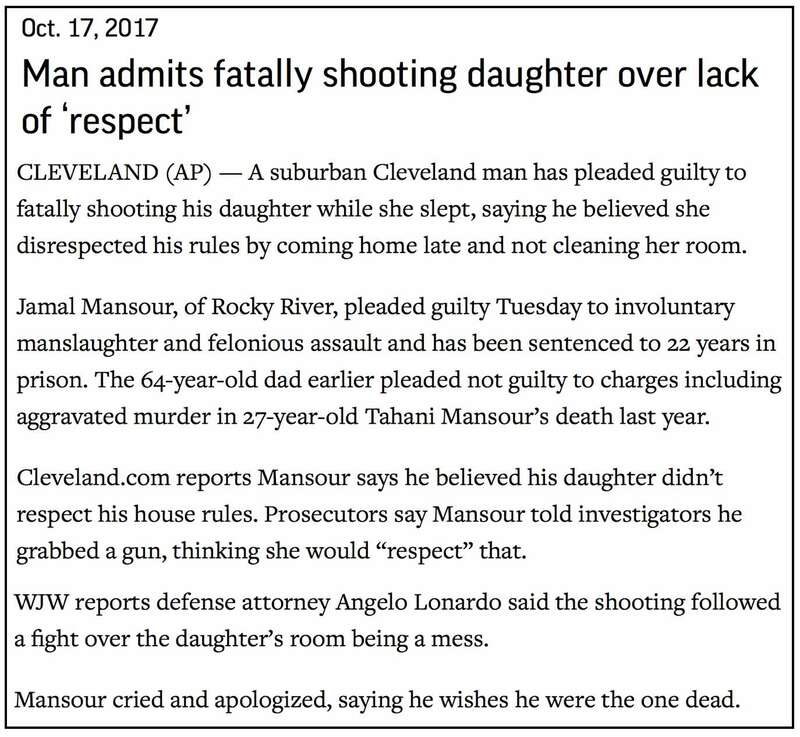 On Tuesday, a man admitted that, as written up at Cleveland.com, the website of the Cleveland Plain Dealer, he killed his 27-year-old daughter in September 2016 "because he felt she disrespected his rules about coming home late and failing to clean up her room." One of those rules was clearly: Don't date non-Muslim men. Though he avoided using the actual term, PD reporter Adam Ferrise at least gave readers enough information to show that what took place was a de facto Muslim "honor killing" — something a related Associated Press report was determined not to enable readers to discern. A Rocky River father admitted Tuesday that he shot his 27-year-old daughter to death because he felt she disrespected his rules about coming home late and failing to clean up her room. ... Rocky River police had only been called to his home one other time, in 2012 when Marsour threatened to kill himself because his daughter was on a business trip in Las Vegas. ... Assistant Cuyahoga County Prosecutor Andrew Rogalski said the father and daughter had several issues with each other in the months leading up to the shooting. "When she was with him, she had to pretend like she was with other people," Rogalski said. "She was worried about what would happen if he found out." They also fought regularly about the state of Tahani's room, which included piles of clothes all over the room and half-eaten meals left under her bed. ... A few nights after Marsour returned home (from a month-long trip to Jerusalem), Tahani came home after midnight and the two argued. She brushed him off, went upstairs and fell asleep, Rogalski said. Marsour ... told investigators that he grabbed ... (a) gun and thought: "If she doesn't respect me, then she'll respect this," Rogalski said. Any knowledgeable reader would recognize Marsour's act as an "honor killing" tied to his daughter's refusal to adhere to his Muslim-based norm. Honor killings are not exclusively committed by Muslims, but they from all available information constitute a large majority of them. Nowhere in Islam, Hinduism, or any of the major faiths does it say that this is acceptable. 'Honor' is a man-made acceptable cultural practice. Perhaps, but that clearly isn't how some communities of certain followers of those religions interpret things — and the fact is that most of the communities who believe honor killing is justified just so happen to be Muslim-dominated. Note how the AP completely erased any reference to Tahani's non-Muslim boyfriend. We're also now being told — more like "ordered to believe," if the PC crowd ever gets its way — that female genital mutilation is really really not based in any particular religion, even though its victims are predominantly Muslim. Again, we're not that stupid, which is why the press is also under-reporting, downplaying, and avoiding coverage of this growing problem in the U.S.